A paver stone patio makes a great update to a backyard and also increases its utility. A custom patio stone design can be created easily, because pavers are a modular building system, and patio designs are easy to find online or in how to books. Technically, patio pavers by definition are made of concrete that is cast into a mold. However, many homeowners use the term 'paver' to encompass a wide variety of modular building materials used for patio construction. Stone: Stone is the most expensive type of paver. Sandstone, limestone, and granite are stones used to make pavers. Concrete: Considered the only true paver, concrete pavers can be made to emulate other materials, such as stone. 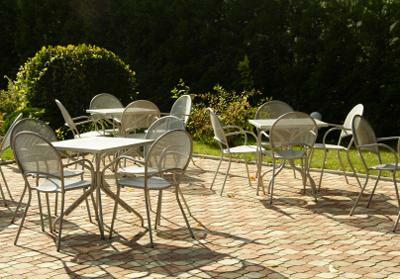 These pavers tend to be the least expensive type available, although the price can climb for special sizes and colors. Brick: Many designs are available for brick patios, ranging from classical to contemporary. Brick has long been prized for its versatility and is very inexpensive in many parts of the country. Adequate drainage is essential in patio construction, not only to prevent pools of standing water, but to prevent damage to your home. A patio should always have a slight slope away from the house to prevent water from accumulating near doors and at the foundation. A carefully prepared foundation of compacted dirt and several inches of gravel and sand will help prevent shifting of the pavers. It also helps address any lingering drainage problems. The edges of the patio should be protected and carefully laid to prevent drifting and wear over time. Often edging or a competing pattern is installed to mark the edge of a paver patio. Patios made from pavers have grown in popularity because of several clear advantages they have over other patio and deck types. Once the patio has been properly installed, it should require very little maintenance. Clearing debris with a broom or gentle power washing is all that will be required for most patios. Stone, brick, and concrete are some of the most durable building materials available. A well constructed patio, even with regular use, can easily match the lifetime of your home. One clear advantage of a modular building system is the ability to add on as needed. A homeowner with a limited budget can build a modest patio and add on at a later date with little difficulty. Motivated home owners who don't mind manual labor can construct a paver patio without professional help. Laying pavers requires little skill, just a lot of careful preparation and a willingness to work hard. Professional tools, such as a compactor, can also make the job much easier. A professional contractor may be required if significant site modifications are required to create a level space. Pavers that are chipped or cracked can easily be pried up and replaced. Homeowners should save extra building materials for such repairs, should they become necessary. After you've decided on the type of paver you'll use for your project, you'll need to determine the number of pavers required. A paver stone patio can be a great addition to many types of homes. The low maintenance cost combined with the durability and adaptability of pavers can make it an attractive option for many homeowners. However, even a modest paver patio can be expensive to construct when compared to other deck and patio options, and do it yourselfers may be deterred by the amount of manual labor required to build the patio. For those concerned about their budget, another type of deck or patio may be a better choice.